Time passes so very quickly when I am in Kigali. I arrived here in late August and am already having to think of going back to Britain! We have been very busy indeed, we are near to the end of the school year now and there are school reports and parents’ meetings to organise. We are also thinking about next year. We have been almost overwhelmed by requests for places, we simply cannot accommodate all the children who need places and it is heartbreaking to have to turn people away. I came back to find some lovely new murals which had been painted by two secondary students for us. They had been trained by a VSO friend of mine, thank you Paula! The boys had mixed the colours and made the designs themselves. The children love them and I often see them talking about what they see. The teachers also use them for lessons – in addition to the animals you see here we have maps of the world and of Rwanda and are planning more to be done in December. We have been very lucky to have two new friends working with us. Claire has worked really hard with the children and staff of the nursery section, helping them to develop their group work and general curriculum so that the children are more actively involved in their own learning. There is now a lot more creative thinking and the children are now very used to working in small groups and discussing things together. In particular Claire has introduced some small games skills and the staff are now happy and confident to organise these activities. We are also very grateful to Bronwen and Alex who have also been working with the nursery classes. Thank you very much! My friend and neighbour Irene has also visited to see the project and she has been giving some advice to the people of the co-operative. Many groups in Rwanda produce similar things so the search for new things is constant. Some of the members have been making bathrobes for adults and children and casual trousers. They have also made some cafetière jackets pencil cases and other small bags. I know the people of the co-operative are very grateful for her ideas and suggestions – thank you Irene! It was also lovely to see our new big playground at the back of the property. It has made such a difference to us as the pressure on our small space is growing. The children can now run freely outside and enjoy a big game of football. Thank you to Belgian Karen for organising the digging and flattening of the place for us. Below are a couple of pictures of the playground taken by Kirstie who visited us for 3 weeks and gave an intensive input into story writing in English with Primary 3 She will be thrilled to know that the children were able to construct a letter to the Commissioner General of Police with minimal help. Kirstie also took these lovely pictures of some of the children – thank you Kirstie, wherever you are travelling now and remember us when you get back to Australia! Finally we had our annual ‘Founder’s Day celebrations which coincides with my birthday. We had a good day which the pictures below will illustrate. It involved presentations by each class, speeches from local dignitaries and a dancing display from a group we support and singing by a choir formed from the women in our literacy class. A good time was had by all! The last picture for this time is of Pauline. Those who have seen the very first newsletters of 2006 will perhaps remember her. She was a very poor and destitute child who was hungry to learn and who got herself to school each day back then. She was very malnourished and neglected by her mother who eventually abandoned her. Tamar, who teaches in Nursery 1, took her in and she has been sponsored to go to a local primary school. She was first in her class last term and has continued grow in confidence and achievement. 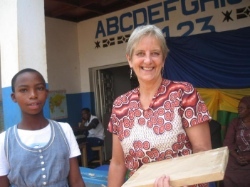 Pauline’s story is just one of the many successes of this project. Through the kindness and generosity of my family and a growing number of friends worldwide, we are making a significant impact on the lives of some people in this area. Small is beautiful! On behalf of the people of the Kinamba Project, I thank you very much indeed. Wherever you are I wish you good health, peace and happiness.